Hey, what’s going on, you guys? 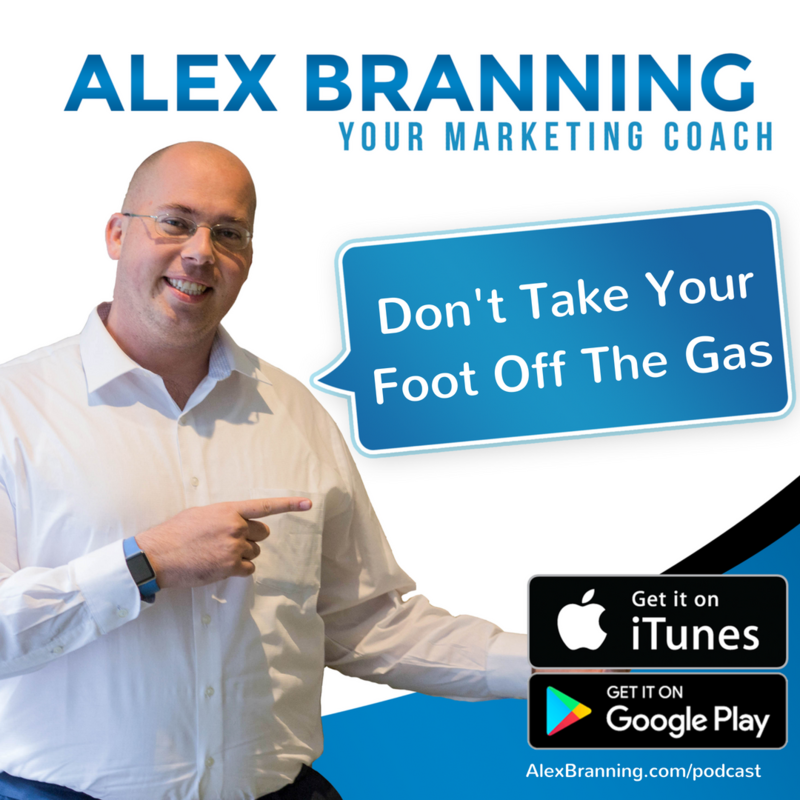 Alex Branning here, Your Marketing Coach, and I want to talk today about taking your foot off the gas and why that is such a huge mistake. I was talking with a client of mine, I’m not going to name him, but he probably has the same mindset you do. When he reached his goal, he wanted to just kind of take it easy. I got a call from him, and he said, “Alex, great news. I hit my goal for the month.” This is the month of June, I’m recording this on July 1. He said, “I hit my goal for the month. We’ve got a couple of weeks, let’s go ahead and just turn off the marketing and save some money.” He wanted to take his foot off the gas, because he reached his goal. I’m like, “Cool. Why don’t we keep that momentum going so that come July you’re already crushing it, you’re already in the lead, you can just keep picking up victory after victory after victory and not have to start the month with your back against the wall?” He’s like, “Wow, I never thought of it like that.” And I’ll be honest with you, I also had the same limiting mindset when it came to reaching my goals, that once I hit my goal, that I stopped, that I took my foot off the gas. I mentioned it before, I was a competitive swimmer when I was younger, and my sweet spot of the race was when I first dove in. It was that first 25 meters of the race. My best events were the 50 meter and 100 meter freestyle and then the 100 meter backstroke. Those were my events. That was where I really shined on the swim team. The first burst was definitely my best, and when I was younger and just getting started, I would dive in, I would just start crushing the competition. I’d look around, I’d get to the wall when it was ready to turn, and I’d realize, wow, I’m really in the lead. And me as the young swimmer, that young athlete, I was like, cool, I can just kind of take it easy, and I’ll win this thing. Well, what would happen? Well, I was going slow, my competitors in the pool were like, oh my gosh, I need to put everything I have into the last 25 meters so that I have a chance to win this thing. Then by the time I saw them out of the corner of my eye, it was too late, because I was going at a level seven, they were going at a level 10. Their momentum would carry them to the end of the race, and they would win. There is a lesson in there for business too, because we will often, when we see that we’re in the lead, when we see that we’re hitting our goals, achieving the things that we set out to do, checking things off the to-do list, we take it down a notch. And we put these barriers in front of us. A lot of times, you know, one of the best methods to achieving greatness is by giving yourself short-term goals,so that statement is true, because anybody can do anything for a short amount of time, including playing at a level 10, putting everything you’ve got into your business. However, the month-long cycle is merely something that we have created in our imagination, because that month-long cycle only exists within our minds. Because when the clock went over from June 30th to July 1st, absolutely nothing changed in your business from one day to the next, except for the fact that you probably reset your goals and said, “All right, time to hit the next level. Time to get that 10 sales a month.” But other than that, nothing changed, but our mindset come June 20th … When my client hit his goal, he was like, “All right, cool. The next 10 days, I’m going to just take it easy.” His competitors did not have the same mindset. I was like, “Oh, okay.” That hit me. Wow, in my mind I’m already easing up, letting my competition catch up to me, and then I’ll go on another sprint, which is foolish. And so what did I do? I looked around for ways so that I could use my position in the market to my advantage. I ended up buying one of my competitors. I probably paid him more than what his company was worth, but it also came with a lot of residual revenue, because he had some contracts in there. So I bought his business, which was not doing great at the time, but he did have some residual contracts, bought his business, and I was able to use that not only to show the rest of the local market that I was doing well enough to buy out a competitor, because it really said a lot to the marketplace that I was able to do that, but that residual revenue gave me enough of a cushion to where I did not have to worry come December. Because December’s always a slow month for me, at least it was, in the marketing space, because a lot of times people would take their foot off the gas around Christmas, because they don’t want to work that hard. And I get that. I was the same way. But the residual contracts that I had, that I got when I was at the very top of the mountain, allowed me that cushion to stay there. And so that is a lesson that I took, like wow, I need to use my spot on the mountain so I can keep climbing.And that same lesson is things that are still do today. I see my spot, I’m going up, I look behind me and I go wow, I’m beating my goals. Instead of going, cool, I’m going to ease up a little bit, I look and go, okay, what can I do to take this position and strengthen my foundation so that this new spot on the mountain becomes the lowest point of the rest of my career? There is a great goal-setting method that I use to get my mind right about this. It’s the BAM goal-setting method. B-A-M, BAM. B stands for baseline, A stands for amazing, M stands for miraculous.This goal-setting method gave me a huge shift in my mindset around my goals, because I love monthly goals. I use them, by the way. I’m not making fun of monthly goals, or I’m not saying don’t do them, I’m just saying don’t let that 30-day barrier give you an excuse that once you hit your goals, to stop, because that’s foolish. Your competition will catch up and then use the momentum and lap you, if that’s your mindset. But the BAM mindset says once I reach my B, my baseline goal, then I go for my A goal, the amazing goal. And once I hit the A goal, I don’t stop, I go for the miraculous goal. Let me give you an example. 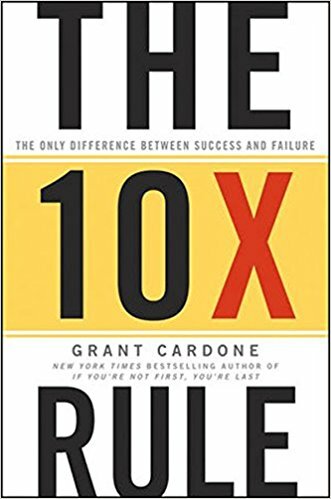 I love Grant Cardone’s book, The 10X Rule. If you have not read it yet, grab it. It’s so good. In that book, he uses a story. I’m going to butcher it, so I apologize, Grant, Uncle G, if you’re listening to this. But in that book, he talks about when he had to meet a quota. I think it was like 10 sales for the month. He was like all right, what do I need to do to get 10 sales? I have to get 40 appointments, because I’m closing one out of four. What do I need to do to get 40 appointments? I need to make 100 phone calls. So instead of me making 100 phone calls, which will result in 40 appointments, which by my averages equals 10 sales, I will instead of making 100 calls, I’m making 1,000, so that I know that I will not miss my goal. When he hit that 10, great. He went on to the next one. He said what can I do to double my goal? That’s the BAM method. He did not use that terminology, but that’s what I’m talking about. He said all right, I hit the baseline, now what? That’s the same mindset that you have to have. It’s not about the hours you put in, it’s about the effort and the work ethic that you have around your business.That’s going to determine whether or not you stay at the same level of success. It’s not about hours. Time is simply one way to measure how much work you’re putting into your business. I don’t care if you spent 10 or 12 hours a day. If you work longer than I do, that doesn’t mean you’re working harder than I do. In fact, if you’re working 12 hours a day, you are probably not working as smart as I am. And I’m not saying that to boast, I’m saying that I have a team. This is my last point of the call. I have a team of people that are around me. 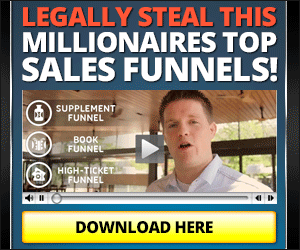 Now, you’re listening to this right now, and you are a solo entrepreneur, you are in business by yourself, and you’re saying, “Alex, when I hear level 10, what I hear you saying, Alex, is take my eight hours a day into 12,” and that’s not what I’m saying. I’m saying work to the best of your ability for eight hours a day and bring on a fricking teammate. Find a virtual assistant.I hear these excuses. “Alex, I can’t afford a virtual assistant.” That is a bunch of bull, because even if you had somebody working for you for five hours a week at $10 an hour, that’s $50 a week. If you can’t afford $50 a week, you have bigger problems than not hiring a virtual assistant. So that excuse is out the window, and $10 an hour gives you someone who can do baseline tasks for you. Now, if you don’t know where to find a virtual assistant, hit me up. I got a gal named Liz who is awesome. She’s got a team of virtual assistants, so if you’re going, “I don’t know where to find them,” boom, that excuse is off the table. Hit me up, I’ll introduce you to Liz. You’re like, “I don’t have the money to pay it.” Bull. Start small. I don’t care if it’s two hours a week, 10 hours a week, get them going on something, have them doing revenue-producing activities. Do the follow-up, set the appointments for you, make new contacts. If you have somebody on your team dedicated to revenue-producing activities for two hours a week, two hours a day, 10 hours a week, I don’t know what the number is, just figure out how to get them started. You can always add more hours later, but get them started. Don’t let your small mindset keep you from the big things that you could be achieving. Bring on a team member, and commit to having them on your team. 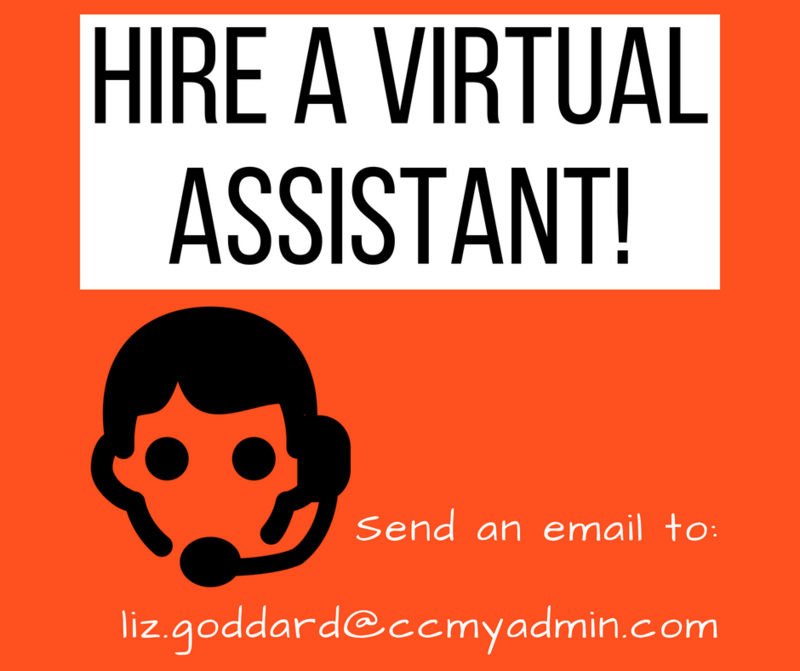 Final thing, you’re like, “I don’t know how to train a virtual assistant.” Well, if you connect with Liz, you won’t have to, if you’re doing some stuff like follow-up. But my secret to this, for the people that need to do things exactly the way I do them, is I videotape myself doing the task, so that they can see exactly how I do it, and they do not have to follow some written formula. They can literally watch the video of me doing the thing. So if you’re going, “I don’t know where to find them, so I can’t hire a virtual assistant,” that excuse is off the table. Hit me up, I’ll introduce you to Liz. If your excuse is I don’t have the money to hire a virtual assistant or build my team, bull. That excuse is off the table. Start them small, then grow up. If you’re saying, “I don’t know how to train a virtual assistant, I’m not good at team management,” no problem. I just showed you how to train somebody, and if you work with someone like Liz, then she can help you manage the person on her team that you hire, even if it’s for just a small amount of hours per week. So there you go. Do not take your foot off the gas. Do not stop. Play at a level 10 every single day, even if it’s working for five hours a day.It doesn’t matter how long you work, it matters how hard you work and how effective and productive you are. And then bring someone on your team so that you’re not making mistakes, so that you’re not relying on yourself to do all the work, because for as long as you rely on yourself to do all the work, you’ll be stuck. Again, if you rely on your own efforts to create your revenue, you will never achieve results more than what you’re achieving right now, because you’ll always only be you. You don’t want that, and I don’t want that for you. Do me a solid. If you’re listening to this right now, and you got a lot out of this, share this with somebody, because somebody in your life needs to hear this message. Please review me on iTunes as well. That helps other people find me and realize that they should take 10, 15 minutes listening to this. And I want to give a shout-out. I got a lot of people reaching out to me after my Be Teachable episode, saying that it touched them, it impacted them, they loved what I had to say. So thank you very much for the kind words. I love hearing that. The words of affirmation are awesome to me, so thank you for that. I do not get tired of hearing that this is impacting your life. I love that. It keeps me going, it keeps me pushing through, creating great content for you guys. So thank you for the words of affirmation. I appreciate you. Have a great day, and if you need help, if you want someone to talk to, do not sit there wishing you had someone to talk to. Reach out to me right now, go to alexbranning.com/call or find me on Facebook and just shoot me a message. Have a great day.